You've heard of Amazon's plan to deliver packages using drones; now a new company called Starship is promising to disrupt local delivery with the launch of a self-driving robot that can deliver groceries to customers' doors in under 30 minutes for less than £1. 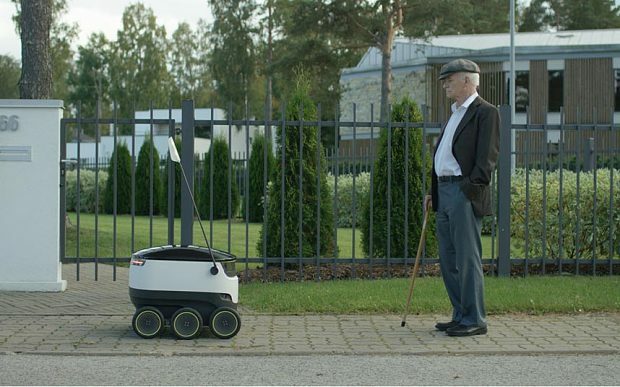 The Starship robot has been developed by Skype co-founders Ahti Heinla and Janus Friis. It drives on pavements at an average speed of 4mph, and uses proprietary mapping and navigation technology to avoid crashing into obstacles, (check out the video we made). Starship is currently testing and demonstrating prototypes of the robot, and plans to launch pilot services in the UK in 2016. Mr Heinla said the robots are primarily intended for use in suburban areas. One of the first pilot areas will be Greenwich in East London. Each robot can carry the equivalent of two grocery bags (20lbs). They will operate out of hubs – shipping containers that are specially built or co-located within grocery stores or warehouses. The robots will return to their hubs between deliveries to recharge and be cleaned if necessary. Customers will be able to book deliveries and track the robot’s progress on their mobile phone in real time. The cargo space will remain locked and secure until the robot arrives outside the customer's front door. The customer can then unlock it using their mobile app and retrieve their groceries. The robots will drive autonomously up to 99pc of the time – using a combination of cameras, GPS, gyroscopes and pre-installed mapping data – but a human operator can assume remote control at any time. "If we decide to start serving an area, we need to run the robots for some period of time under human control – maybe a few days, maybe a few weeks, to map all the landmarks and lanes and potholes. After that, the robot can drive itself," said Mr Friis. "If anything comes up, like a difficult road crossing or a new unexpected situation on the roads, or if there are lots of people around and it needs to figure out how to navigate through them, it can always call home, and the operator can see what the robot sees and overtake the driving." The local delivery market is worth approximately £150bn in the UK alone. This includes parcel and delivery companies (20 pc) and personal shopping trips by people (80 pc). 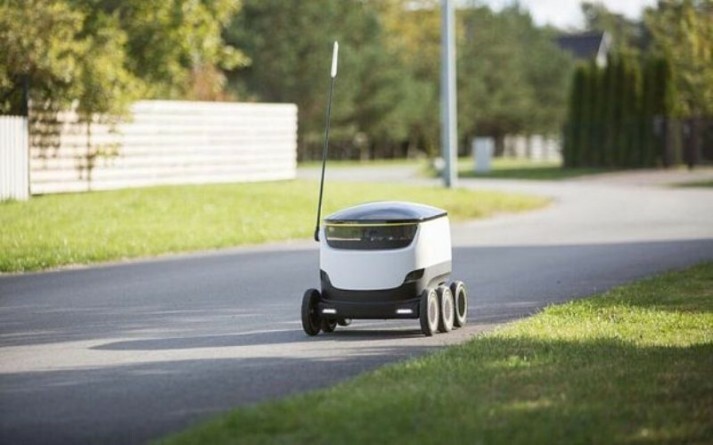 Starship said that robot deliveries are potentially five to fifteen times cheaper than current "human-powered" delivery services. "It does not take the whole delivery chain from an Amazon warehouse to your doorstep, it only takes the last few miles. But right now the last few miles are the most difficult part for the delivery vans. They need to find parking spaces and so forth, so our robot is taking care of that," said Mr Heinla. "For the large e-commerce companies it helps to reduce the costs. For the local businesses it opens up new possibilities, allowing people to order deliveries over the internet rather than coming to the store physically." Mr Friis added that the Starship robot has been a lot quicker to develop than the self-driving car – which has been 10 years in the making and cost billions of dollars – because the Starship drives on the pavement at a slow speed, so it is much safer.